Thread: 2018 GIJoeCon: Customizing Class Update! It's that time once again customizers and G.I. Joe fanatics! The GIJCC Official Convention is just around the corner, and we have the details on this year's Custom Class character and build. See a full preview of the figure parts and read more details about the parts needed from the Customizing Class page at GIJoeCon.com! Ah, good to see this published! Here are some additional photos of the class parts (sorry, no previews to the bonus for building in class), and my personal fully painted sample. 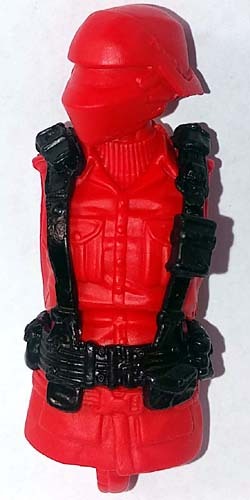 Included in the kit is the brand new original head sculpt by Gigabread, torso, harness, rifle, bloused BDU skirting and logo stickers (not shown in the kit). Gutted to not be able to attend and participate in this!! I'm so glad we finally got the info. After seeing it I immediately started getting the parts needed, I'm going to mix and match different parts of arms and legs to try to make the coolest figure I can. My clock is counting down see you in Chattanooga in 38 days.